It's amazing what li'l hidden gems are out there just waiting for you. I found myself in Grasonville, Maryland today--just over the Bay Bridge from Annapolis--with several hours on my hand due to a pup getting some minor surgery. As I was pulling out of the vet center, contemplating what to do with these hours, I'm facing an arrowed sign directing traffic to the Chesapeake Bay Environmental Center. Several signs and curves later, I'm out in the middle of essentially nowhere...and yet, it's somewhere very cool. Passing through forests, marshes, I found myself on 510 acres of land protected by the Wildfowl Trust of North America, right off the Chesapeake Bay (naturally). I arrived just before 9 am when the kayak camp was to begin, & I got the rundown at the Visitors' Center from one of the camp leaders. She sent me off to go explore wherever my heart desired. Trail map and bug spray in hand, I was off & trekking on a stunningly mild morning for July 1st! Along my travels, a wild turkey and I shared the same stretch of woods, and I even got a peek of a fleeting deer. There was a bounty of bunnies, a bevy of butterflies, and an assembly of dragonflies. Had I chosen, I could have taken some of the center's binoculars along with me to get a closer look at the osprey, ducklings, or the variety of other birds that this girl doesn't know by name. Had I felt really adventurous, I could have set out by canoe or kayak. With a daily boat rental of $10 per vessel, what a deal! I must say though, one of my favorite parts of the day was the wild black raspberry or two I found. Yum! To capture solar energy--the northern and southern sides face the sun by day, the windows are tinted, solar panels are on the roof, and solar tubes are placed throughout the building to bring natural light into the hallways. To control indoor air quality--low "VOC" (volatile organic compound) paint was used; and the facility is heated/cooled with a HVAC-High efficiency unit. It's a pretty remarkable place, with many more resources available at their website. 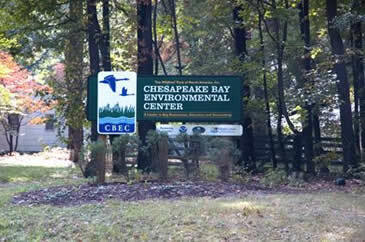 If you're in the classroom in the Chesapeake Bay area, it'd be worth pursuing for a field trip. Or, if you live local, a membership might just be the way to go to plan in some birding, hiking, canoeing or kayaking, or geocaching into your summer. There's so much going on in this little niche! To find out more about the Chesapeake Bay Environmental Center, or to investigate their resources, click the title above, or go to http://www.bayrestoration.org/.